The subject of this column is a dollar coin, but one less widely collected than the popular Morgan series — the Dwight Eisenhower or "Ike" dollar. Created by U. S. Mint Chief Engraver Frank Gasparro and struck from 1971 through 1978, all dates in that span are represented, except for one — 1975. Dollars were struck that year, but they carried the date 1974 or were dual-dated 1776-1976. These later issues were of the Bicentennial type and bore a distinctive reverse. Despite its being a short-lived series, the Ike dollar was minted in two different compositions and in a variety of finishes. A complete set, excluding minor varieties, consists of some 32 coins. Ike dollars are plentiful and inexpensive in uncirculated condition, so there's no point in discussing the grading of worn pieces. Mint state coins, however, do offer some real challenges. The cupro-nickel dollars of 1971 and most of those from 1972 are quite poorly struck. The original master hubs featured several low-relief elements which simply did not reproduce well in the production coins. 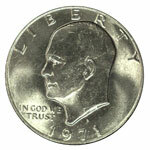 Eisenhower's hair, particularly in the area above his ear, is often found indistinct on these early coins. 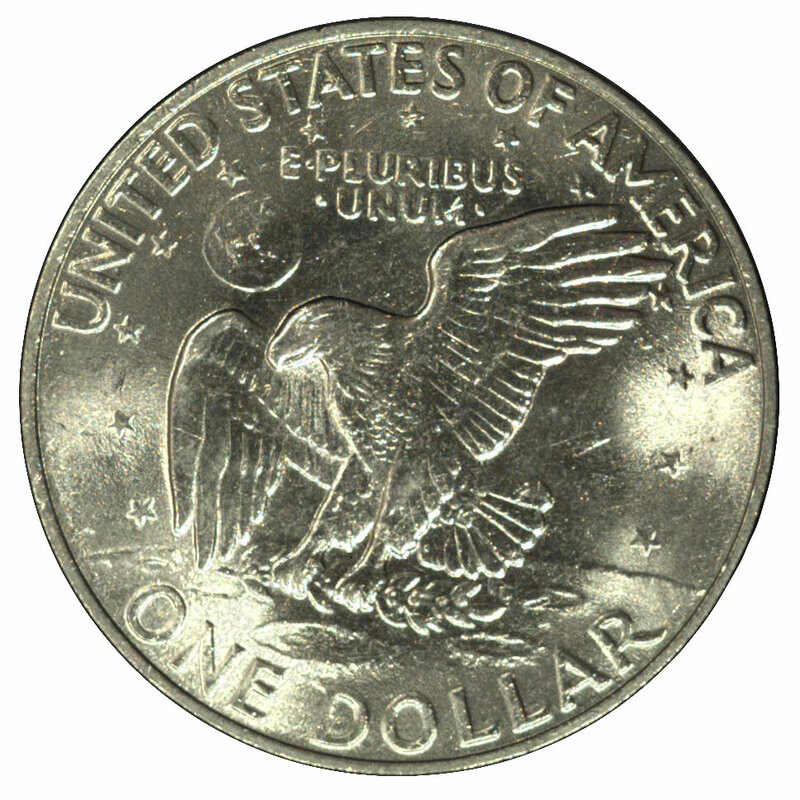 The details of Earth, as seen above the eagle, were very delicately sculpted and are typically a blur on the dollars of 1971-72. Because it is opposite the point of highest relief on the coin's obverse, the central portion of the eagle is often seen ill-defined. These problems were largely remedied mid-way through the 1972 production, when modified hubs were introduced with more deeply-cut details. 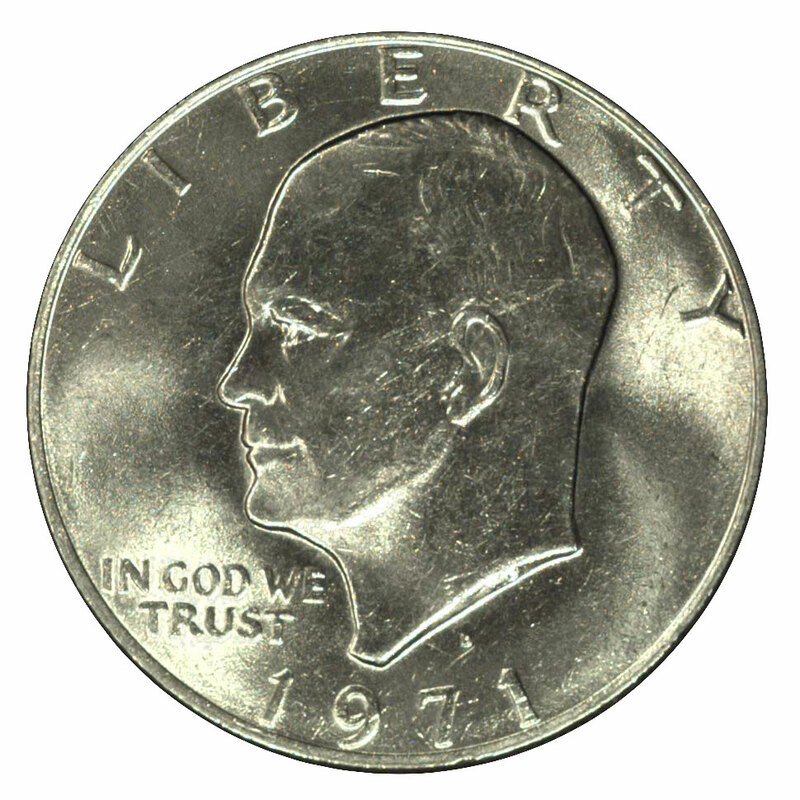 From 1973 onward, all Ike dollars have good to very sharp strikes. Another problem with the early (1971-72) Eisenhower dollars is poor luster. It appears that in their rush to get the coins into production, the Philadelphia and Denver Mints failed to properly polish the planchets, and many of the resulting coins were dull, as made. The P-Mint dollars of 1971 and 1972 are genuinely rare in gem condition, while the 1971-D and 1972-D coins are also challenging to locate in top grades. No dollars were coined for circulation in 1973, and the 1973(P) and 1973-D coins are plentiful in nice condition from the Mint's uncirculated sets. The 1974, 1977 and 1978 dollars minted for general circulation are typically well struck and lustrous, though they're often marred by scratches, cuts and abrasions. The Philadelphia Mint coins are noticeably scarcer in gem condition, due to such marks, while the slightly superior luster of the Denver issues typically gives them greater eye appeal. The Bicentennial dollars dated 1776-1976 were minted as early as the spring of 1975 and were first issued on July 1 of that year. The reverse of these coins bore the awkward, block lettering taken directly from the model submitted by Dennis R. Williams, but this was later modified to conform to the style found on Gasparro's obverse. 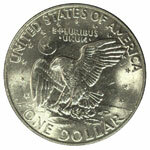 Bicentennial dollars follow a similar pattern to those of the regular type; whether they bear the Type 1 or Type 2 reverse, the Denver Mint coins are usually more lustrous and eye-appealing than the Philadelphia coins, and they typically have fewer and less severe contact marks. As for the collector-edition coins in this series, all are so common in gem condition that collectors should have no trouble securing desirable specimens. These include the copper-nickel proofs dated 1973 through 1978 and the silver-clad dollars, both proof and non-proof, dated 1971 through 1976. All were struck at the San Francisco Mint with great care and are readily available in top grades. The early years, however, are noticeably scarcer with Ultra Cameo contrast, and this is particularly true of the copper-nickel proofs. Though it will never unseat George Morgan's beauty as the most popular dollar coin, the short-lived Ike dollar represents an attainable goal for the series collector. There are just enough challenges to the condition-conscious hobbyist to make the hunt an enjoyable one.